The first courthouse was built in 1854 and served the county until 1883. A new courthouse, pictured right, was built in 1892. The present courthouse was completed in 1956. On August 8, 1851 three commissioners chose the site of the Clarke County seat, which became the city of Osceola. In 1854, a two-story structure was built to serve as the courthouse. The $1,600 building had to be abandoned in 1883 because of wind and weather damage. 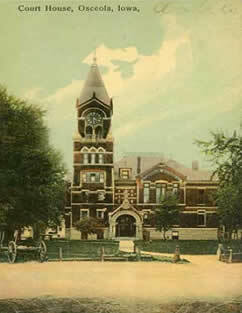 The next courthouse was erected in the public square in 1892. Fifty years later the county outgrew the building and a $275,000 bond was issued for construction. The cornerstone of the new courthouse was laid in 1956. In just three months, the “L” shaped building was completed and it presently sits at the center of the business district in Osceola.